Mamestra configurata Walker, bertha armyworm, is native to North America and is a major pest of canola, so most published literature reports on damage and economic thresholds in Brassica rapa and B. napus, and some suggest that populations (in Canada) have gotten worse with the increasing acreage of rapeseed1. This species has been monitored for 20+ years via the VegNet program, and outbreaks in vegetable crops have been few and far between. However, as with any armyworm, scouting is KEY because when damage does occur, it happens quickly and usually on a large scale. After group feeding on foliage as ‘baby’ caterpillars, mid-stage larvae spin silk threads that help disperse them on the wind, a few meters within a field, and voracious feeding begins. SCOUTING for bertha armyworm involves leaf pulling and visual scans. As a scout crosses a field pulling and examining leaves, they should stop every ten leaves and scan for a plant or a small grouping of plants with a lot of holes in the leaves, then walk to that location and try to find larvae. These patchy, hard-to-find areas of damage are called armyworm “strikes” [there it is]. Pheromone traps are used to monitor activity of adult bertha armyworm moths. 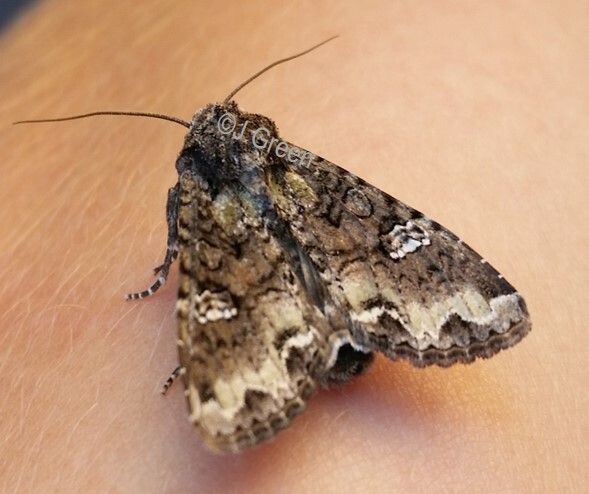 The moths occur at low densities, but any detection of them in a trap is cause for prompt and careful field scouting. Natural enemies (predators, parasitoids, viruses) probably exert heavy levels of control on bertha armyworm, otherwise we would see more frequent outbreaks. 1. Dosdall, L.M. and B.J. Ulmer. 2004. Feeding, development, and oviposition of bertha armyworm on different host plant species. Environ. Ent. 33(3): p. 756-764. 2. Lamb, R. J., W. J. Turnock, and H. N. Hayhoe. 1985. Winter survival and outbreaks of bertha armyworm, Mamestra configurata on canola. Can.Entomol. 117: 727-736.